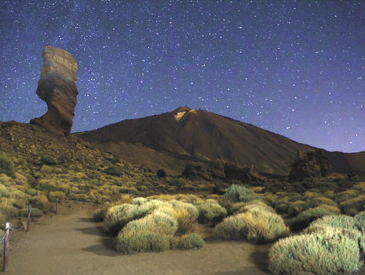 If you’re looking for added interest on a cruise to the Canaries – what could be more exciting than stargazing from the foothills of Mount Teide? Saga’s expert team of Shore Excursion Executives have been out on the road, finding exciting new tours to add to their programme of Canary Island cruises. And this one is something of a blockbuster! Available when Saga Sapphire or Saga Pearl II stay late in the port of Santa Cruz on Tenerife, it makes the most of the Canaries’ pollution-free atmosphere, to reveal the beautiful sunset, followed by stargazing at the constellations twinkling above in the night sky. After leaving the ship in the late afternoon, the excursion begins by slowing ascending up the craggy landscapes of Mount Teide National Park, into the foothills to a height of 7,500 feet. Even this astonishing height is just over halfway up the mountain; its size is staggering. Then, as the sun starts to dip below the horizon, sparkling Spanish Cava is poured – and a toast made to the beautiful sunset as the ridges and cones of the mountain become bathed in soft pinks, reds and purples. After the sunset, guests are taken to a nearby restaurant for a traditional Canarian dinner made with fresh local ingredients, served with wines made on the islands. Delicious! By then, it’s night-time outside, so time to wrap up warm for the incredible stargazing part of the tour. After returning to the mountain, so high you can actually look down on the clouds, the black of night becomes a showcase for the wonders of our galaxy. Gazing up at the stars in this setting is a real once-in-a-lifetime experience – it actually takes a while for the eyes to adjust, as the blanket of stars so far away, somehow seem close enough to touch. An expert astronomer is always on hand, taking everyone on a fascinating journey through the night sky, pointing out the constellations and talking about their history. This includes how the stars were used to navigate ships, plan the planting of crops and study the seasons. Also how the constellations have been the inspiration for stories, religions, art and poetry since the Mesolithic period. This 10,000-year old history is dwarfed by the true age of the stars themselves – some are billions of years old! It’s estimated that 83 of the 88 known constellations can be seen from Mount Teide National Park – all the constellations of the northern hemisphere and most of the southern. The stars and planets are visible with the naked eye, although professional telescopes are available too, for a closer view of some of these celestial wonders.